report = limitcycle(hd) returns the structure report that contains information about how filter hd responds to a zero-valued input vector. By default, the input vector has length equal to twice the impulse response length of the filter. limitcycle returns a structure whose elements contain the details about the limit cycle testing. As shown in this table, the report includes the following details. Granular — indicates that a granular overflow occurred. Overflow — indicates that an overflow limit cycle occurred. None — indicates that the test did not find any limit cycles. Contains the initial condition value(s) that caused the detected limit cycle to occur. Contains the output of the filter in the steady state. Returns the number of the Monte Carlo trial on which the limit cycle testing stopped. For example, Trial = 10 indicates that testing stopped on the tenth Monte Carlo trial. Using an input vector longer than the filter impulse response ensures that the filter is in steady-state operation during the limit cycle testing. 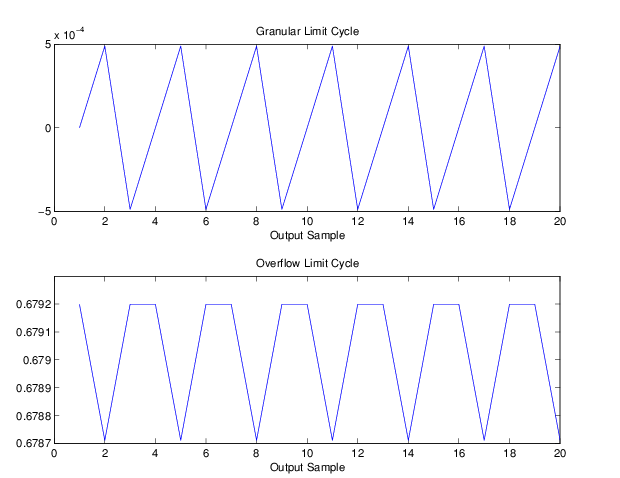 limitcycle ignores output that occurs before the filter reaches the steady state. For example, if the filter impulse length is 500 samples, limitcycle ignores the filter output from the first 500 input samples. During limit cycle testing, if the simulation runs reveal both overflow and granular limit cycles, the overflow limit cycle takes precedence and is the limit cycle that appears in the report. Each time you run limitcycle, it uses a different sequence of random initial conditions, so the results can differ from run to run. Each Monte Carlo trial uses a new set of randomly determined initial states for the filter. Test processing stops when limitcycle detects a zero-input limit cycle in filter hd. ntrials — Number of Monte Carlo trials (default is 20). inputlengthfactor — integer factor used to calculate the length of the input vector. The length of the input vector comes from (impzlength(hd) * inputlengthfactor), where inputlengthfactor = 2 is the default value. stopcriterion — the criterion for stopping the Monte Carlo trial processing. stopcriterion can be set to either (the default), granular, overflow. This table describes the results of each stop criterion. Stop the Monte Carlo trials when limitcycle detects either a granular or overflow limit cycle. Stop the Monte Carlo trials when limitcycle detects a granular limit cycle. Stop the Monte Carlo trials when limitcycle detects an overflow limit cycle. An important feature is that if you specify a specific limit cycle stop criterion, such as overflow, the Monte Carlo trials do not stop when testing encounters a granular limit cycle. You receive a warning that no overflow limit cycle occurred, but consider that a granular limit cycle might have occurred. In this example, there is a region of initial conditions in which no limit cycles occur and a region where they do. If no limit cycles are detected before the Monte Carlo trials are over, the state sequence converges to zero. When a limit cycle is found, the states do not end at zero. Each time you run this example, it uses a different sequence of random initial conditions, so the plot you get can differ from the one displayed in the following figure. The plots shown in this figure present both limit cycle types — the first displays the small amplitude granular limit cycle, the second the larger amplitude overflow limit cycle. As you see from the plots, and as is generally true, overflow limit cycles are much greater magnitude than granular limit cycles. This is why limitcycle favors overflow limit cycle detection and reporting.